Manipur weightlifter Sanjita Chanu finally heaved a sigh of relief after International Weightlifting Federation (IWF) revoked the provisional suspension on Tuesday. 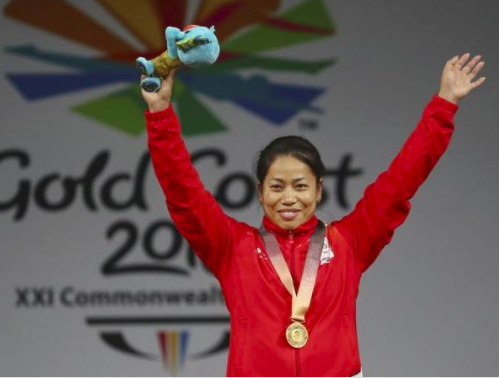 The IWF had put a provisional suspension on multiple Commonwealth Gold winning weightlifter Chanu in May last year after she was tested positive for a banned anabolic steroid on on May 31 last year. The IWF had announced of her doping violation on its website in May last year. A visibly elated Chanu vowed to work even harder after the provisional suspension was revoked. After withdrawing the ban, the IWF’s legal counsel Dr Eva Nyirfa has notified of this decision in a letter addressed to the Indian Weightlifting Federation (IWLF), reports THE BRIDGE. “On the basis of the information at its disposal, the IWF has decided that the provisional suspension of the athlete shall be lifted as of today (22 January 2019),’ Dr Nyirfa wrote in her letter as reported by The Tribune. “The IWF panel will render its decision in the athlete’s case in due course. We remain at your disposal for queries,” she added. Notably, Chanu had always maintained her innocence and had promised to prove her innocence. “I can’t tell you how happy and relieved I am today. I can now focus on the sport again. I am thankful to everyone who backed me in this fight. Now I can start training seriously,” Chanu was quoted as saying by The Tribune. The sports fraternity has also welcomed the decision of the IWF. In the Gold Coast Games last year, the 25-year-old had won gold in the 53 kg category though she was injured. She got only 20-day time for the preparation and managed to clinch the gold in style. In 2014, she also won gold in the 48-kg weight category at Glasgow.